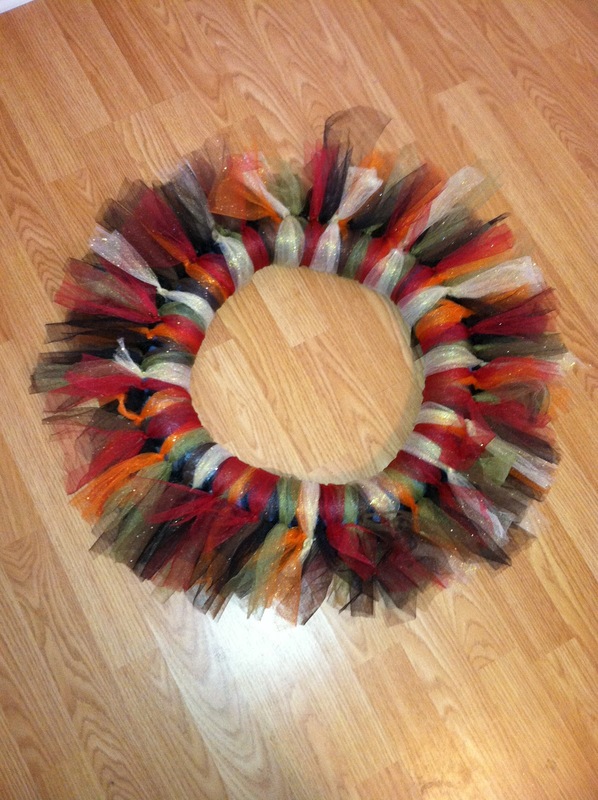 I was inspired to make a fall tulle wreath for my front door from this picture on Pinterest! Various colors of tulle. 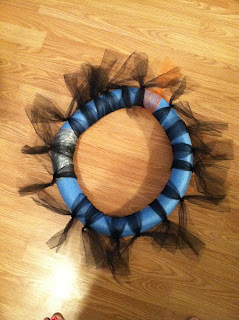 I purchased rolls of tulle at Hobby Lobby this week. 50% off! $2 a roll. For this size wreath, I used 1/2 of a 12 yd roll and about 1/3 of the 25 yd rolls. I used black, brown, orange, cranberry, green, and gold / yellow. 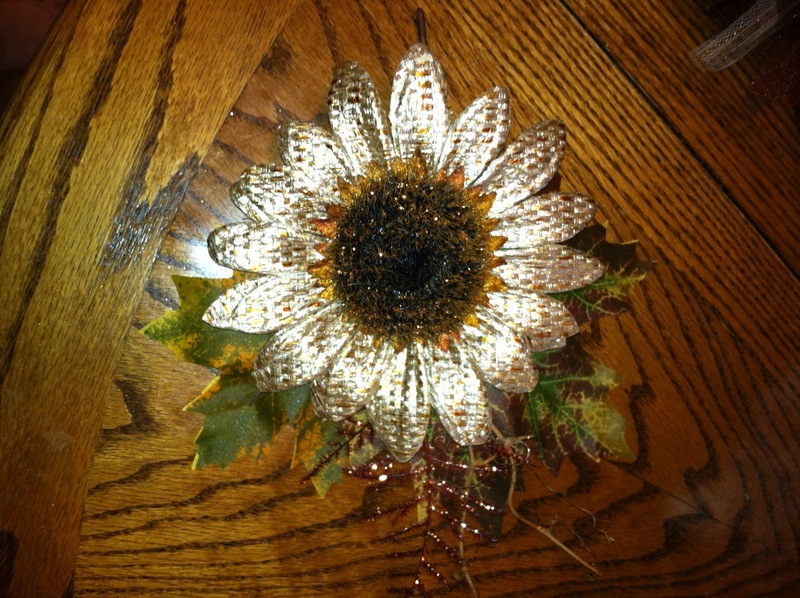 Flowers / other accesories to decorate the corner of your wreath. To get started cut your tulle into equal size strips. 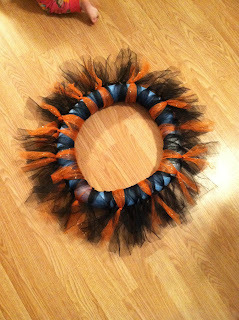 Use whatever size you want depending on the width of your wreath and how far you want the tulle to flair out. I cut mine into about 20" strips. Start with the dark colors first because you will end up overlapping colors and you don't want to cover up the light colors with the dark. So I started with black. Simply tie the strip of tulle around the wreath and make a knot. Be sure to make your not on the outside of the wreath so the tulle will flair to the side. Start with the darkest color and tie a few at various places around the wreath. Once you have your wreath covered and are you're satisfied with your tulle you can add an accesory to the corner or anywhere on your wreath. You can add flowers, acorns, really anything. I chose this little guy from Hobby Lobby. I found it in the fall section and it had a nice long stem I could just tuck it in the tulle to attach it. No hot glue needed. And here's my finished wreath hanging on my front door!! Looking back I think the only thing I would have done differently would be to cover the wreath in ribbon or something first. I had to work very hard at making sure the summer blue pool noodle couldn't be seen anywhere! Great job! Thanks for joining the party at One Creative Weekend! I hope you have a great week. Thank you so much! I have added that GFC button. Thank you for the tip. I'm so glad I found your blog! Your wreath is gorgeous. Great job! 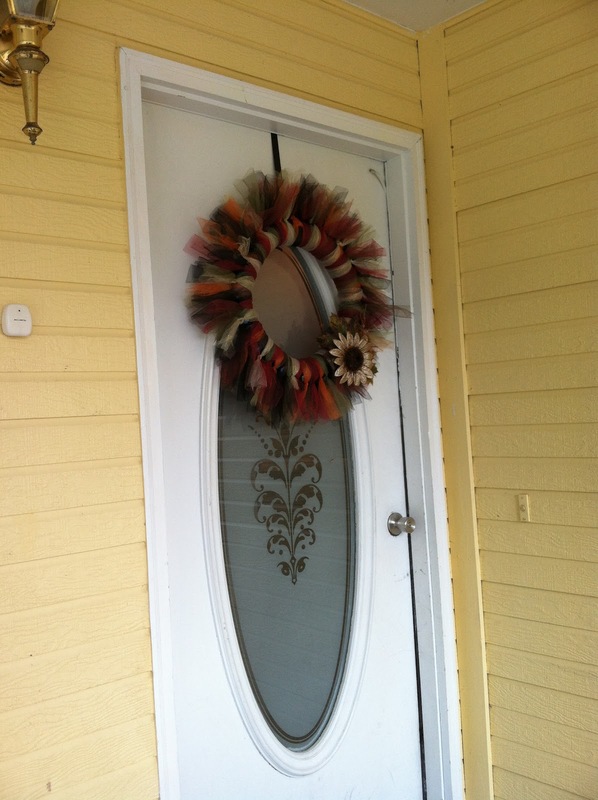 I really like this wreath! I love the colors and the flower. Loving this wreath..and that you used a pool noodle! Awesomeness! I'd love for you to come share this at our Pinteresting Party! Thank you so much! I joined your party! Very cute idea. I was just thinking it's just about time to decorate for fall. I may try this. I'm visiting from the Made U Look link party. Thanks so much Terri! And I'm following yours now. Can't wait to try your cookie recipe! Love how this came out! Never thought to use a pool noodle. I see some crafting in my future. Such a pretty wreath! Great work! 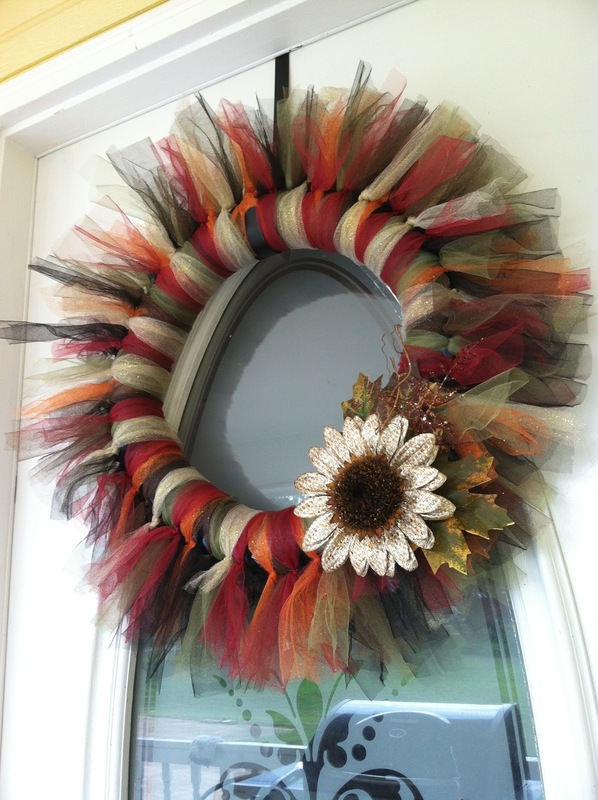 LOVE this wreath and LOVE how simple/inexpensive it is to make! I featured you on my facebook! Thank you so much for the feature! I have spent way too much time on your blog this morning haha Look forward to your future postings. Oh wow thank you so much for the feature!! I love your fun blog! This is adorable! Excited to see what else you will be in the up coming posts! New Follower! Gorgeous! I love how it turned out! Thanks for sharing at the Pomp Party! Pinning to our Pomp Party board! Thanks for linking up to last week's Tuesday Confessional link party! Your post has been featured so head on over and grab a brag button! Thank you so much Macy!!! I found you via the blog hope on Sasse Life... I have followed you GFC. Thanks Heather! I am following you now too! And your DIY Chalkboard Plate is at the top of my want to do list. I cannot wait to try it! Cute! I love the colors and the texture! Not only is it pretty, I bet you had a bunch of fun creating it! I love your wreath! I need one of these for my front door! Thanks for linking up with me for Friday Favorites! I'm featuring you this week. Come by and grab my featured button if you'd like one. Thanks so much for sharing with us at Someday Crafts! I will be featuring your project this morning on our blog! Thanks for sharing and be sure to grab a Featured at Someday Crafts button for your blog. That wreath is seriously cute. Love the colors and the texture using the tulle gives it. It looks really pretty on your front door! Thanks for sharing your creative inspiration with Sunday’s Best – you helped make the party a success! omggg!!! 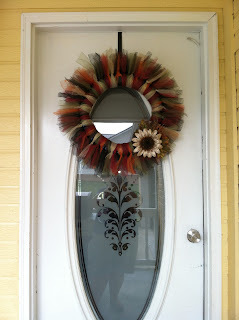 I LOOOVE the look of this wreath.. I love it so much I just left hobby lobby and bought me some to make the wreath as well. I picked up the noodles over the weekend. Thx goodness they are red so it wont be tooo bad trying to cover\hide the blue... too cute... love your ideas..
"Bought me some"--what? Tulle? Did you mean you bought yourself some tulle? awwww!!! thx for following and I will be sure to post it after im done.. thx again. and in depth information you offer. It's awesome to come across a blog every once in a while that isn't the same out of date rehashed material. To "Anonymous": Your first sentence should say "AN" excellent webmaster. "An" is used when the word it refers to starts with a vowel (like "excellent;" "a" is used when the word it refers to starts with a consonant. It is unclear what you mean when you say "you are doing any distinctive trick." After "Also," the "t" in "the" shouldn't be capitalized, there should be a period after "masterwork" and the "Y" in "You've" should be capitalized (although the phrase "The contents are masterwork" is a poor choice of words and unclear.) I'm sure some people will think this is unnecessary nitpicking but the writing content and style, spelling, grammar and punctuation in the majority of internet blogging is so incredibly poor that either the American education system is failing miserably or no one paid attention in English class. Most likely, both statements are true. Perhaps instead of spending their time blogging and crafting, Pinterest participants (in fact, all bloggers) should first take courses in basic English grammar and composition. If it's any consolation, the mistakes in your contribution are far from the worst I've seen but the writing is still at the middle school level at best. You're so awesome! I do not believe I've truly read through something like this before.